The earthy brightness of it! Mud work specimen on walls. My love for colours, patterns and earthen objects always drew me to handicrafts, especially embroidery, mirror work, pottery and the likes. However, I am no expert and may still not be able to distinguish between machine-made products and handicrafts. But for most of my years, I always saw handicrafts as cute little souvenirs. Something to put up in your home and discuss with friends, after a recent trip. And the pragmatic in me always questioned the money I spent on buying a handicraft, when a similar machine made design is available for half the price at the mall. I consoled myself thinking that I liked the imperfections that each hand made design would have. The snobbish value of a hand-crafted object appealed to me too. And my vanity took a boost when I thought I had contributed to the ‘poor’ artisans’ household income. In those regards, our stint in Kuchchh was an eye opener. I understood the origin and transformation of handicrafts. For the first time I could appreciate the handicraft market not just from a consumer point-of-view. And now, I am without pity for the ‘poor’ artisans. I truly respect them. It is interesting to understand that the articles which we term as handicrafts were actually utilities of the pre-industrialisation era. Before the mass produced printed fabric came in picture, clothes for daily wear and special occasions were stitched at home or within the community. Even the fabric was woven locally in most cases. My parents’ generation wore tailor-stitched clothes. As a kid I wore frocks, pinafore and sweater stitched and knitted by my mother, till the readymade clothes took over and fashion started changing every three months. Before the current use-and-throw invasion of consumerism, the quilts and their covers were up-cycled every few years using patchwork or appliqué. A faded kurti was dyed and zari border of an old sari was preserved to be used for a salwar kameez design. This was when mass production hadn’t seeped into every aspect of our home. 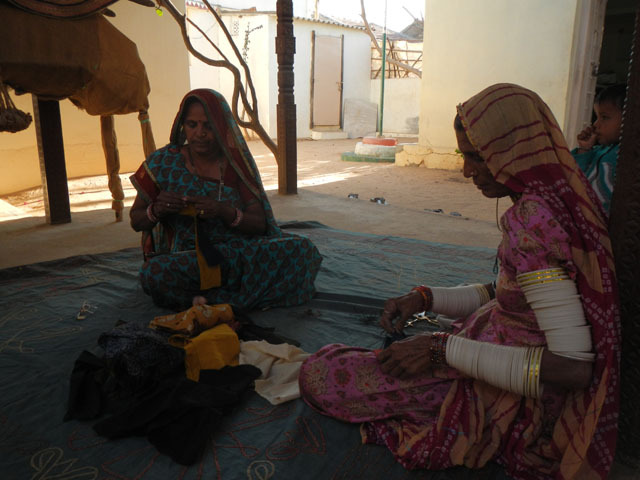 Knitting, Stitching, mud coating the chulha, milking the cows were skills not readily available in exchange of money. And thus an individual’s time wasn’t valued in the amount of money he/she can make. My mother and mother-in-law, both have specimens of their hand-embroidered cushions covers, bed sheets, kurtis etc. They had the time and the skill to do it. But they also had option to give money and get a machine produced product from market. The only option that our generation seems to have. Now think about a village community a few generations before our parents. They didn’t have a go-to-market option. The clothes had to be stitched or knitted at home. ‘Market’ mostly meant local community and the skills were more or less bartered. The trade amongst various cities or even nations existed, but the machines were still to take over. In that scenario, each household knew how to make trappings for animals, do lipan to beautify the walls, produce embroidered cholis and kanchlis for wedding and have rogan printed skirts and sheets. There was a local blacksmith, goldsmith, even a lacquer worker to make wooden articles of daily use. Old Rogan printed Duppata…its almost an antique! Each article needs a lot of time to be completed. 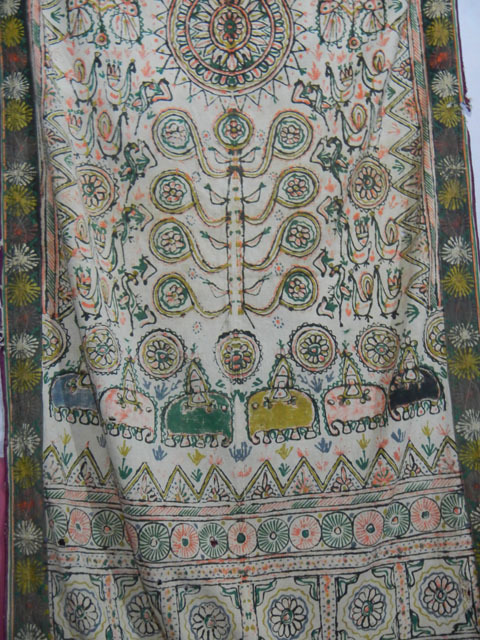 A rogan printed sari, for example, can take upto a month. But it was okay, since there was no necessity of change of wardrobe every year. And the clothes were up cycled. But if you talk in purely monetary sense of time’s worth, handicrafts will be expensive. So when machines came in picture, an artisan had no way to compete with the level of productions as well as prices. Most of them turned labours to work in these factories producing the homogenised standard versions of their cultural art. 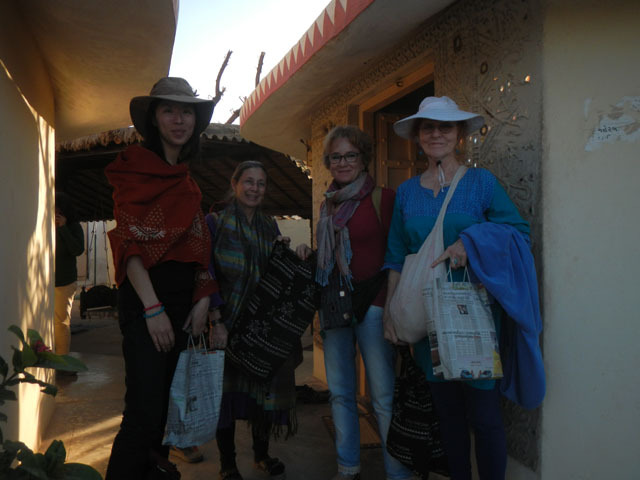 Judy Frater, one of the founding members of Kala Raksha – a trust working towards preserving arts of Kutch – has many wonderful insights to share. She has been in India for over two decades and founded Kala Raksha Trust and later Kala Raksha Vidyalaya for preserving and promoting the cultural heritage theses arts stand for. One of the most annoying and deeply saddening things, according to her, is when the designers treat the artisans as mere labour. These designers take a traditional design, creating standard print pattern and then asking the artisans to fill up with embroidery; pretending they know more. She, therefore, founded Kala Rakhsa Vidyalaya which is a design school of artisans. It’s a one-year course admitting only the traditional artisans, equipping them with design knowledge for today’s marketplace and enabling them to go on their own without the need of a designer. Kala Raksha and a lot of other organisations like Khamir, Qassab etc. 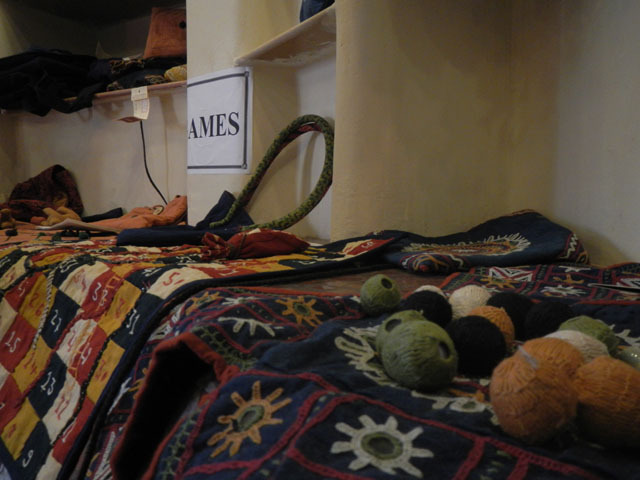 are also taking the handicrafts direct from artisans to the consumers without a middle man. This spells prosperity for small single household artisans, especially women, who can not match the production demand by vendors. Tourism today has also given a boost to the artisan’s income, with people being interested in the traditional hand crafted art instead of mass-produced ones. You can see a number of tourists at the house of artisans in Nirona village, especially for the rogan art. 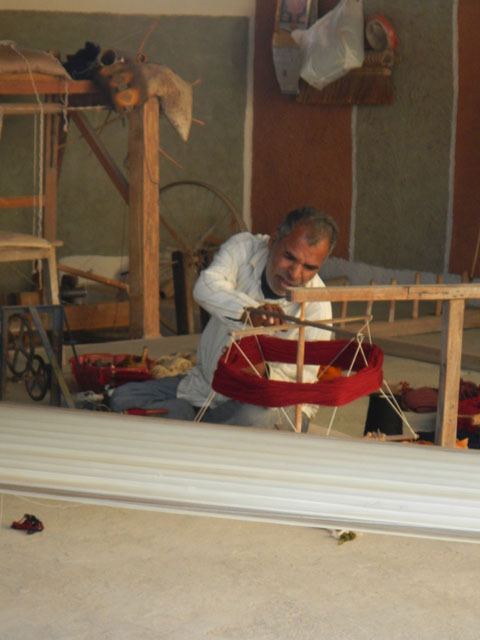 Gafur Bhai’s family is the only family in the world to practice Rogan Art – an oil based free-hand painting of fabrics. The family already has two national awards to its name. They, however, are not happy with the lack of support from the government. They are entitled for support to participate in a certain number of international trade fairs every year, but the opportunities never come. Till such a time when the government starts enabling this participation, they would keep the trade secrets and the art within their family. Not everyone is unhappy though. The participation of Indian handicraft artisans in international trade fair has increased and this means opening up of new markets for them. 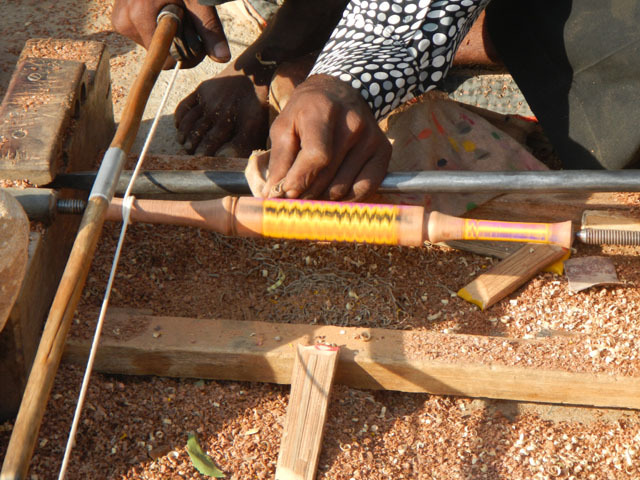 Even when the treatment and recognition of the handicraft artisans is improving, the fact remains that handicrafts have changed their forms with time. From utilities, now they are objects of collection – an art. It is good news that they still have a market, however niche. This ensures that the skill and tradition won’t die. But from being utility items of village community, handicrafts are now for the effluent class or foreign tourists who can afford to pay the price for something that require days to be made. Ironically, most of this effluent class are the industrialists. Although it saddens me that these genuine everyday articles are becoming connoisseur items, I am glad that the traditions are preserved. Because when the time comes where the distribution system based on trucks (and hence oil) collapses, all we will be left with are the skills and craft or an opportunity to barter these skills. My mother will still be able to upcycle and produce clothing articles and so will these artisans.